Bollywood Superstar Salman Khan has recently launched his new film ‘Dabangg 3’, another sequel in the ‘Dabangg’ franchise. Prabhudeva is directing this film, produced by his brother Arbaazz Khan, under ‘Salman Khan Films’ banner. 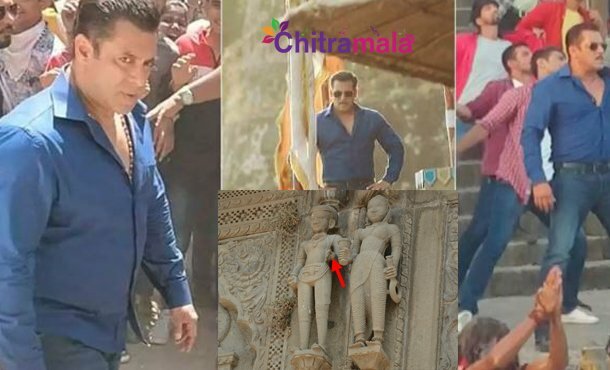 The film landed in a ‘Shiva Ling’ controversy in the last week, where Salman clarified that it was a simple misunderstanding and not any demolition. Well, it ran into another problem today. The shoot is carried out at Ahalya fort in Madhya Pradesh. During the shifting of equipment, an ancient statue in the fort has been wrecked accidentally. The news spread out and the pictures of the wrecked statue is floating all over the internet. When the equipment was being lifted with the ropes, it hit the statue and got wrecked. There has been aggression from local people for the wreckage.